I was sitting outside the big corporate building for what seemed like my hundredth interview this year. Agile, discombobulated – I was thinking whether I would be welcomed by another Muslim – who am I kidding – maybe another POC (person/people of color), but as I walked in and rode the elevator up, I was invited in by two white executives, accompanied with crooked smiles, and side-eyes. Fifteen minutes later, I was already out, driving home with an eerie feeling I have come to know too well. Needless to say – I did not get the job. Granted, as “diverse” as San Antonio is portrayed to be, there is a sense of disconnect and isolation towards Muslims and there needs to be a serious reckoning. To be a Muslim in America means to be overlooked. To be a Muslim in America means to be undermined, and unappreciated, and always second-guessed. As America is growing, the bridge dividing Muslims and others seems to be growing too. What’s worse, the bridge is getting rustier, and more ancient. America is economically segregated depending on what side you are on. Add religion and race to the mix, and the difference is even more marked. If you happen to be Muslim and Black, you better believe that it is twice as hard for you out here. The Council on American-Islamic Relations has reported that since 2017, the number of hate crimes and mosque attacks have risen significantly. Anti-Islamic rhetoric is on the rise and was used by President Trump and Republicans alike as propaganda that fueled his, and other campaigns during elections. In 2017 alone there have been 115 documented arson attempts against mosques around the nation. And with the rise of social media, more and more citizens are being caught and video-taped displaying verbal, and sometimes physical abuse towards POC, including Muslims. Hate only drives out more hate, and right now, we live in a nation where people with power act as enablers to the portion of the public who condone these acts. At the Islamic Center of San Antonio, which was also threatened with violent hate-crime attacks during recent elections, many Muslim youth gather on Friday (Islamic holy day) to pray, discuss Islam, and bond on issues facing us, that only we understand. This includes job-related issues, our search to find a place where we fit in, and injustice we may experience from our peers and elderly. Now, this might sound like every 20-something-year-olds crisis – maybe not – but there is a secret we Muslims share, and that is deep down, we know it’s something we can’t control: Why do we have to constantly remind the outside public that we are good guys? We are tired, and will no longer keep these issues inside mosques to cope. The new generations of Muslims are speaking a little louder, and not just settling for anything. Older Muslim generations are definitely more hush about issues, and treat America as the token it is i.e. a gateway to their better life. According to the U.S. Religious Census, older immigrant Muslims are more satisfied with the treatment of Muslims, than Muslims that were born in America. I believe that this is because, unlike our parents, we were born here, or have lived here majority of our lives, yet still feel like outsiders, resulting in frustration with whether we truly belong. Our parents, who may show no interest in changing the system, are still, after all these years, trying to adapt to it to see where and how they belong. But we are not like our parents. Majority of us are home, and we are here to make a change. One Friday, my local Imam (Muslim preacher) gave a sermon after prayer about how the Quran teaches us to be a loving Muslim, despite us not receiving the same love in return. He reminded us that all the people in this world are from a single pair, and the only reason they were given the names of different races and tribes was to help them identify and relate to each other. Differences in color of the skin, or the sectarian background of a person is not something that makes a person inferior of superior; rather it is the level of piety and righteousness of a person that gives one a higher standing. Our differences should be fuel for peace and understanding, and be used to make our communities a safer and happier place for the next generations to come. In reality, Texas has the largest Muslim population in America, yet it is not represented to that extent. As a matter of fact, locals don’t even see this as positive, but a statistic that is rather alarming. As a result, there are more attacks on Muslims in Texas than Muslims committing actual crimes. Muslims have the lowest crime rates and are least likely to commit crimes because of our strong faith and teachings of Islam. This is a statistically-proven fact. 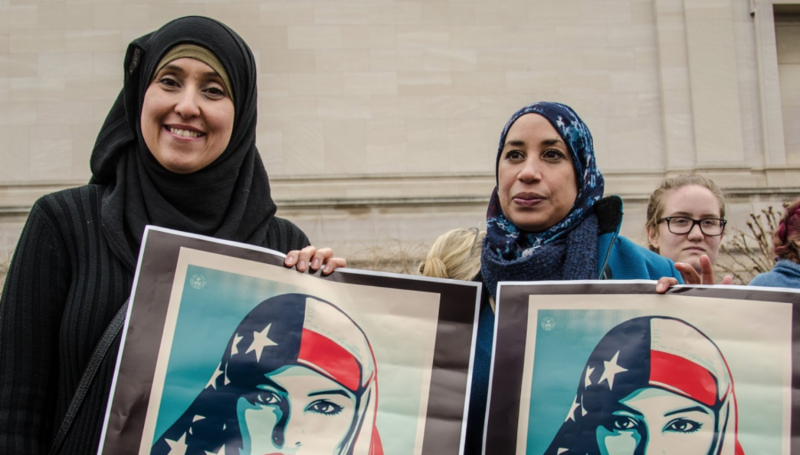 However despite the seemingly insurmountable odds, two Muslim women, Rashida Tlaib and Ilhan Omar, are on their way to becoming the first Muslim congresswomen, and both are doing so with little support or endorsements from outside their community. They have achieved this feat alongside their true supporters -both Muslim and non-Muslim. Additionally, in Texas, a Pakistani immigrant named Salman Bhojani just won a seat on his local city council. So we are thriving despite the odds. Having Muslim representation, especially in law and public service, not only gives everyone a voice, but especially those who don’t care to participate because of a lack of representation, or interest shown in them as a minority group. There needs to be more of an effort to include Muslims when it comes to job security, schools admissions, organizations, and government. We are going to school (a lot of us being the first in our family to reach this milestone), we are voting, we are concerned citizens, and when there isn’t a voice for us, or better representation, then we fall behind, not based on talent, but based on a mere lack of exposure. We are proving ourselves to be resilient, and realizing that the only way to get through the door is not by knocking politely and waiting, but by letting ourselves in, or by building our own door. We are here to stay, we are already home.